How can you improve the performance of web pages? Poor old HTML gets neglected, despite being the core language of the web. HTML payloads are big and getting bigger. Pages on most top-100 sites require around 40k of HTML per page. Sites such as Amazon and Yahoo use thousands of lines of HTML per page. The youtube.com home page currently clocks in at a whopping 3.5K HTML elements. Reducing HTML complexity and the number of elements in a page won’t improve parse time much – but well crafted HTML is a crucial foundation for building fast-loading pages and layouts that respond successfully to different viewport sizes. In this article you’ll find out how to write clean, concise HTML that enables you to create content that loads fast and works well across a variety of devices. In the process, you’ll learn how to build sites and apps that are easier to debug and maintain. There is always more than one way to write code – especially HTML. Rather than begin every sentence in this article with ‘In general …’ we’ve gone ahead and prescribed what in our experience usually works best. That doesn’t mean that every suggestion is right every time. Separate concerns: use HTML to add structure, not to style content. Keep it clean: add code validation tools to your workflow. Keep it tidy: use tools and a style guide to maintain consistent code structure and formatting. Learn the language: get to grips with element structure and semantic markup. Ensure accessibility: use ARIA attributes as well as fallback attributes and content. Experience your site with a text only browser or screenreader. Test: try out your site on multiple devices and screen sizes, use emulators and performance tools. HTML is a markup language for adding structure and meaning to content. HTML should not be used to style content. Don’t put text in heading tags to ‘make it bigger’ or use blockquotes just for indentation. Instead, use CSS to change the appearance and layout of elements. The default appearance of HTML elements is defined by a browser’s default stylesheet: Chrome, Firefox, Internet Explorer and Opera each have their own. For example, in Chrome the h1 element by default is rendered as 32px bold Times. That way, browsers have CSS information ready before parsing HTML. Alternatively, use the defer and async attributes – but be aware of their behaviour: script elements with an async attribute aren’t guaranteed to be executed in order. Also consider support: async is only implemented in Internet Explorer 10 and above; defer is only partially supported prior to Internet Explorer 10. A major reason for the success of the web is that browsers handle invalid HTML. There are even standardised rules for how browsers should render invalid code. However, this is NOT a reason to be laissez-faire. Valid HTML is easier to debug and often smaller in file size, faster and less resource-hungry to parse and render. Invalid HTML can make successful responsive design difficult to implement. Writing valid HTML is particular important when working with templates: what seems to work OK in an isolated chunk of code may go horribly wrong in combination with other content. Incorporate validation in your workflow: use validation plugins such as HTMLHint and SublimeLinter with your editor and incorporate validation in your build process using tools such as HTMLHint with Grunt. You can check code online with tools such as the W3C HTML validator, and share configuration files with project contributors. Use the HTML5 document type. Make sure to add closing tags to all elements that aren’t self-closing. <p>...and pesto is easy to make. Consistent formatting makes HTML code easier to understand, optimise and debug. Maintain an HTML style guide for project contributors (or use an existing one like Google’s). 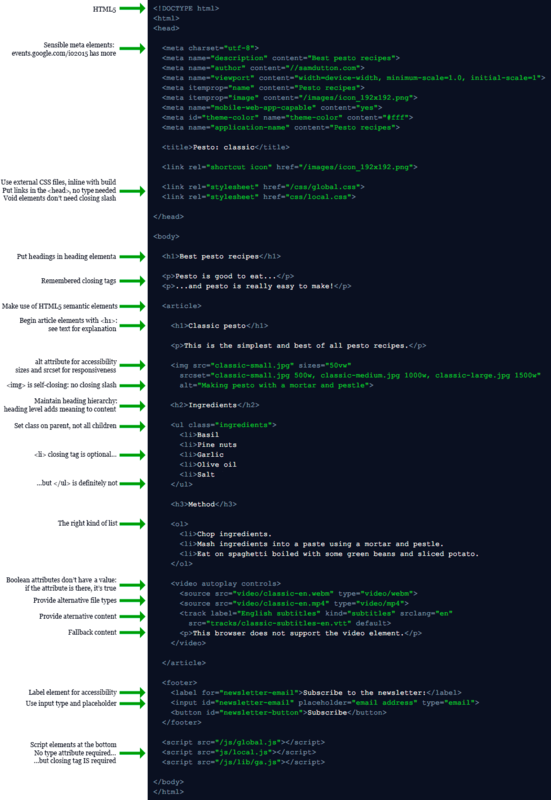 Use your editor to automate code beautification. For example, in Sublime Text add a shortcut for Reindent. You can check layout with code linters such as SublimeLinter or online tools such as CSS Beautify and JS Beautifier. Don’t go mad with hierarchical HTML indentation! This can easily get out of hand, so set rational defaults for when to begin an element at the left margin. Conversely, deep hierarchies may mean you need to refactor. Standardise on indentation and use either spaces or tabs, not both. Order elements in ways that won’t be a surprise to other developers – or you in six months. For example, a footer element should go at the bottom of your .html page, even though (in theory) it could be put anywhere. Standardise on single or double quotes. Semantic means ‘relating to meaning’. HTML markup adds meaning to content: element and attribute names describe the role of content. HTML5 introduced a number of new ‘semantic elements’ such as <header>, <footer> and <nav>. Use <h1> (<h2>, <h3>…) for headings, <ul> or <ol> for lists. Note that <article> headings should begin with an <h1> (reasoning here). Where appropriate, use the HTML5 semantic elements such as <header>, <footer>, <nav> and <aside>. Use <p> for body text, HTML5 semantic elements (or as a fallback) to structure content – not vice versa. Use <em> and <strong> rather than <i> and <b>: use HTML to add meaning, not styling hints. This has a bonus side effect: the for attribute means that clicking on the label automatically throws focus onto the input element. This is particularly useful for checkboxes and radio buttons. To reiterate: HTML should be used to add meaning and structure to content, not for styling. Use <p> elements for text, not for layout. By default, <p> has margins and other styles applied by the built-in browser stylesheet. Avoid using <br> for line breaks: use block elements or the CSS display property instead. The <br> should only ever be seen within text – and even then, only very rarely (for example, as a form of punctuation within poetry). Avoid using the humble <hr> to add horizontal lines: CSS border-bottom is a better option. It may make sense to use <hr> to denote a thematic break. Don’t use divs unnecessarily: the W3C HTML spec describes the div as ‘an element of last resort, for when no other element is suitable’ (sixrevisions.com). Style inline elements such as links and img elements with display: block, rather than putting them in divs or (worse) using <br>. Learn which elements are block level, to avoid unnecessarily putting block level elements inside divs. For example, there is no need to put a list inside a div element. Do not use tables for layout. Do use tables for tabular data. Flex box is now widely implemented: use it. Use CSS padding for padding and margin for margins: understand the box model. Standardise on margins: it’s often best to add margins to the bottom and the right of elements, rather than the top or left. Whatever you do, avoid mixing top and bottom or left and right. Use the last-of-type selector to avoid redundant margins. Coding for email is nothing like coding for the modern web. Avoid inline CSS. For performance optimisation, CSS files can be inlined as part of your build process. Use an ID once and once only: there should only be a single element with id=”foo”, id=”bar”, or any other ID. Provide fallbacks: add captions and subtitles with the track element, include fallback text and/or images in video and audio elements; use poster images for video; add alt attributes to every image (give the alt attribute an empty value if the image is only for decoration). Add title attributes to links – but only if the title adds meaning and doesn’t just repeat the link text. Use type and placeholder elements in input elements. Conversely, do not unnecessarily encode characters such as en dashes (for example, 4–5 weeks) or currency symbols such as ¢ and €. Build HTML testing into your workflow, toolchain and deployment processes. Test page load on a variety of devices, on large and small screens, in a variety of connectivity contexts. Try interacting with your page with a text-only browser such as Lynx, or with a screenreader such as ChromeVox. Use emulators such as Chrome Dev Tools device mode to monitor changes. Page Speed, Web Page Test and other tools can be integrated with your workflow to automate testing before or after deployment. This entry was posted in html5 and tagged High performance HTML, HTML, html5, web performance. Bookmark the permalink. Thank you, Sam, for the post! It’s been good and !important to revise the html basics in one place. Finally!!! Nobody ever talks about HTML cleanlyness and performance. I insist on this topic whereas I keep seeing HTML bloated with tons of classes (thanks to bootstrap!). I shared this on Twitter. I hope you get lots of page views! Just keeping the html as minimal as possible and easier to reason about helps so much, not just for performance but development and maintenance down the line. Also keep the nesting depth as low as possible for best mobile performance. Take better advantage of html and body tags themselves as part of your styling for your website. Hell you could even set display: block on your head elements and children. Good spot – thanks. Fixed. This post is just what I would like to have written. During my day job, I see a lot of horrifying HTML. It is obvious that not everyone cares deeply about it. I’m not really a fan of removing either. Thanks – look forward to more information about the typo ;). The hr element does add meaning and structure to a page (http://html5doctor.com/small-hr-element/). Agreed, it’s not a good choice for visual styling, but it does have semantic value, even if hidden with CSS. Thanks for pointing this out. I’ve updated the text. Mucha gente debería aprender de éste documento. Imprescindible. Essential. When clicking on the label, it automatically throws the focus onto the input element that is nested. This is particularly useful for checkboxes and radio buttons. Good call – added some text. Thanks! This is one of those posts every web developer should read, bookmark and reread now and then. I have always gone by this rule, but I notice you never close the script tags. I’d be interested to know about the validity of this, because I can’t work out from w3.org whether it is considered “valid” HTML. I meant to fix this and forgot. I’ve added tags as well as a note. Thanks for the great, thorough post. I do have one thing to add..
Not trying to dispute what you said, but letting people know there are some gaps in the tech as it stands Jan 2016. Having CSS in a separate file will measurably degrade page performance compared to putting the CSS in the head of the HTML file. There is no good reason to force users to download more files. Caching isn’t going to make up for the benefit of having the CSS right there in the head in most cases (test it). This is why Google’s AMP spec requires all CSS to be in the head, and bans external stylesheets.